Oncology - area of medicine and biology, which studies the causes, mechanisms of development and clinical manifestations of cancer, diagnosis and treatment of benign and malignant tumors, such as cancer, melanoma, precancerous lesions, as well as engaged in the prevention of the spread of cancer. 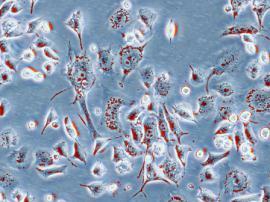 Changing the natural cells of any organism is the essence of the whole cancer process. These cells are transformed under the influence of various carcinogens and acquire special properties. In particular, they begin to proliferate limitlessly, thus forming a tumor germ, which, in turn, is the only source of growth and development of tumors. Cancer cells are progressing (continuously divided) in the living body by being at the stage of immaturity and having properties unlimited reproduction. This is due primarily to the fact that the process of development and growth of the tumor does not obey biological laws of the body and increases autonomously. It should also know that after the appearance, the tumor is growing constantly and will stop only when the host organism dies, or when it is destroyed through the use of medical means. Currently, there is a gradual increase in the proportion of oncological diseases in the structure of overall morbidity and mortality. This is explained by significant advances in other fields of medicine and the increase in life expectancy (with age, likelihood of developing cancer is significantly increased). Carrying out radical treatment in the shortest terms. Preventive work among the population. 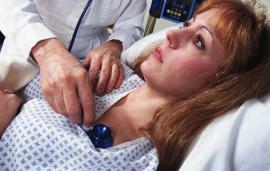 Ensuring a high patient quality of life after treatment. The search for new methods of diagnosis and treatment. There are several of Non-specific symptoms of Cancer lesions of organs and tissues. The second symptom suspicious of neoplasm - anemia. Third symptom consists of several sub-symptoms that have a common mechanism of origin. It can be long subfebrile (increased body temperature to small numbers), leukocytosis (increased levels of blood leukocytes) and the acceleration of ESR. The fourth symptom is characterized by a disturbance of appetite, appearance of aversion to the some kind of food (eg meat with stomach cancer). Pain, usually in the affected organ, but may be referred pain. By its nature, the pain is dull, sharp, burning, tearing, piercing. The Specific symptoms of Cancer lesions include bleeding, swallowing disorder, dyspeptic disorders (nausea, vomiting, heartburn, belching, diarrhea or constipation, bloating), various skin lesions (in the localization of cancer on the skin), and others. It is necessary to pay attention to the effect of treating a disease state. If the drugs do not help, the symptoms of the disease continues to increase, should seek immediate medical attention! At the first suspicious symptoms, the physician should assign a mandatory minimum list of tests: general blood and urine tests, blood chemistry, chest X-ray, gynecological consultation, ECG,ultrasound, MRI, fibrogastroscopy are appointed when indicated. Already on the basis of the primary results of analyzes can indirectly judge about oncology. Surgical removal of tumors within the limits healthy tissues. Currently, operations are becoming more gentle and less invasive. Radiation therapy - provides maximum accuracy in the process. Chemotherapy - administration of drugs destroying cancer cells. Hormone therapy - relevant in cases when on the tumor cells there are receptors to certain hormones. There are other methods of cancer treatment, but they are more specialized and are used less frequently. Great importance in the successful treatment of the patient and the possibility of his return to a healthy and fulfilling life plays early diagnosis of cancer. This is the main factor that affects the outcome of treatment. Virtually any type of cancer can be cured if detected early and if accepted timely medical measures. The best way to warn yourself from cancer lesions is preventive examinations. The annual visit to the gynecologist, the passage of fluorography, blood and urine tests, etc. can prevent or detect in the early stages of oncologic disease. This in turn gives a guarantee evolved for complete cure, because in the last stages cancer is virtually untreatable. Be attentive to your health! How is it we have cancer?